The five-member national selection committee of the Board of Control for Cricket in India (BCCI) has named the 15-man India squad for the ICC Cricket World 2019. 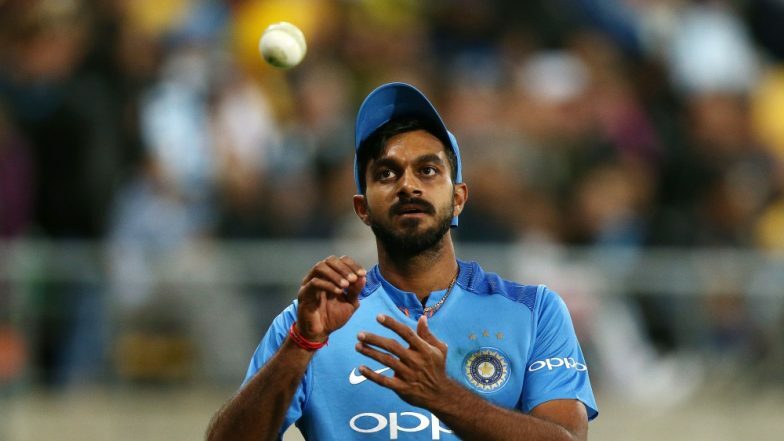 All-rounder Vijay Shankar has been included in the squad for the world cup, which will be led by Virat Kohli. Rohit Sharma has been retained as the vice-captain of the side. Chief selector MSK Prasad, however, said Shankar is preferred to bat at number four. India Team for ICC Cricket World Cup 2019 Announced: Virat Kohli-led Side Includes KL Rahul, Dinesh Karthik, Vijay Shankar and Ravindra Jadeja; No Place for Ambati Rayudu and Rishabh Pant. After Hardik Pandya’s suspension following the Koffee With Karan controversy, Vijay Shankar was added in the team. The 28-year-old made good use of the opportunity and scored 45 against New Zealand. His bowling skills also earned him praise. With Ambati Rayudu not picked, Shankar is set to bat at number four in the World Cup. ICC Cricket World Cup 2019 Schedule in PDF: Ticket Prices, Dates, Venue Details & Timetable Available for Download Online. Meanwhile, in the ongoing Indian Premier League 2019 (IPL 2019), Shankar playing for Sunrisers Hyderabad (SRH), has failed miserably with the bat and in seven innings has managed to score just 132 runs, with highest score 40 runs.